When humans are “well,” they are in a state where body, mind, and spirit are holistically integrated, and, as a result, are healthy, happy, and resilient. The same can be said for a thriving business. 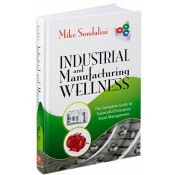 Industrial and Manufacturing Wellness: The Complete Guide to Successful Enterprise Asset Management explains how to use reliability engineering principles to design and build companies that are robust, reliable, self-improving, integrated business systems best suited for achieving optimal results. Written by asset management expert Mike Sondalini, creator and author of The Plant Wellness Way, this revolutionary work goes beyond basic plant management. Instead, it reveals a completely new way to engineer and implement business processes and work flow strategies that deliver overall operational excellence. The author introduces risk management, decision-making methods that prove the worth—or not—of a change before it is initiated in the organization, thus protecting a company from making the wrong choices. His universally applicable process improvement concepts empower readers to take a system-wide approach that can be repeated infinitely to deliver maximum success. Mike Sondalini, MBA, CP Eng., is an expert in information and knowledge management, risk management and elimination, quality management systems, asset management, and operational excellence and reliability engineering. His immersion in these areas led him to create “The Plant Wellness Way,” a life cycle asset management methodology. He subsequently coined the term “Industrial and Manufacturing Wellness” to depict a holistic, business-wide system of reliability.